Since its inception over 40 years ago, OAKWORKS has maintained a strong commitment to environmental wellness and making products in the US. Our business model relies heavily on ensuring sustainable resources - both natural and workforce-related. We have a proactive plan that addresses both aspects of sustainability to ensure we are doing our part to preserve the health of our planet and the wellbeing of our employees. OAKWORKS is committed to US manufacturing, which requires adherence to the Environmental Protection Agency's stringent standards for water, air, and waste. U.S. companies that outsource manufacturing to low-cost labor parts areas of the world, such as China, are not held to the same high environmental standards. In addition, companies who import finished goods via container ships from halfway around the world burn large quantities of fuel, contributing heavily to pollution. OAKWORKS operates a dry plant that does not produce liquid effluents as a byproduct of manufacturing our products. Factories that produce liquid effluents increase pollution and risk contaminating our streams, rivers, tributaries, and seas, jeopardizing the health and survival of fresh and saltwater ecosystems. 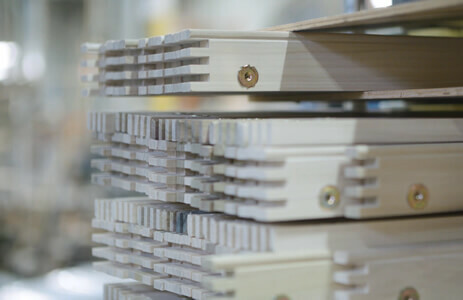 OAKWORKS uses only water-based finishes in its US factory on all of its products to minimize fumes in the production process and eliminate off-gassing in finished goods. OAKWORKS recycles scrap aluminum and steel. 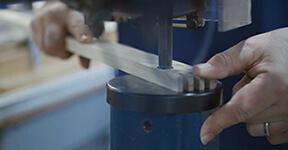 OAKWORKS generates a very low volume of scrap material (such as fabric, foam, and wood) when making tables by using computerized machinery that maximizes utilization. Scrap is used in the production of accessories and smaller items whenever possible. 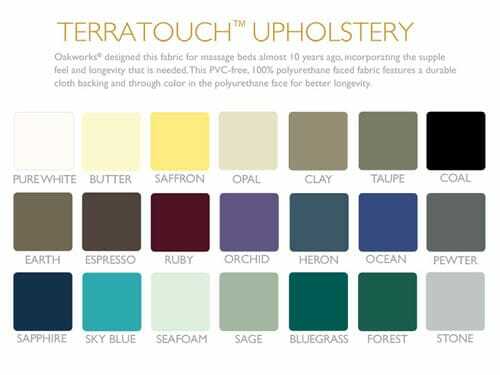 OAKWORKS uses 100% polyurethane (PU) fabrics � no polyvinyl chlorides (PVC) in its spa and massage products. When PVC degrades, it generates dioxins whereas PU fabrics do not. PVC is in the process of being banned in the European Union partially for this reason. OAKWORKS> uses only 100% CFC (chloroflourocarbons) free foams in its products. OAKWORKS sources only responsible hardwoods to manufacture its products, ensuring that wood is procured from managed forest sources. We are a Forest Stewardship Council registered manufacturing facility and have a line of FSC certified products. OAKWORKS U.S. manufacturing associates enjoy a clean, safe work environment with access to company sponsored health insurance plans and the extra protection provided by The Occupational Safety and Health Administration's (OSHA) regulations. This is not true in other parts of the world commonly used as sources for low cost labor manufacturing. OAKWORKS maintains very high air quality throughout its plant so that employees have clean air to breathe. This includes a state of the art particulate dust collection system and spray booths designed to ensure fresh air for operators. Our standards meet or exceed OSHA requirements. OAKWORKS has created ergonomic workstations for its production employees that include features such as on demand height changes and rotating work surfaces to minimize reaching, which reduces the risk of injury. OAKWORKS uses automated production equipment whenever possible to minimize the physical strain on employees during the manufacturing process and prevent repetitive stress injuries. OAKWORKS supports local sheltered workshops for the handicapped by outsourcing work that can be done by these groups. OAKWORKS is a Corporate Sponsor of this great organization dedicated to education of both Spas and their customers. Visit their site at greenspanetwork.org.